Tapioca is essentially a flavourless starchy ingredient, or fecula, produced from treated and dried cassava (manioc) root and used in cooking. It is similar to sago and is commonly used to make a milky pudding similar to rice pudding. Purchased tapioca comprises many small white spheres each about 2 mm in diameter (although larger grain sizes are available). These are not seeds, but rather reconstituted processed root. The processing concept is akin to the way that wheat is turned into pasta. These tapioca pearls are made mostly of tapioca starch, which comes from the tapioca, or bitter-cassava plant. In other parts of the world, the bitter-cassava plant may be called "mandioca", "aipim", "macaxeira", "manioca", "boba", or "yuca". Cassava is native to South America. The balls are prepared by boiling for 25 minutes, until they are cooked thoroughly but have not lost pliancy, then cooled for 25 minutes. The pearls have little taste, and are usually combined with other ingredients, savory or sweet. Tapioca is a word derived from the Tupi language of Brazil (from tipi'óka). 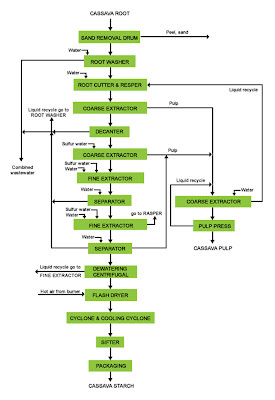 This refers to the process through which cassava (Manihot esculenta) is made edible. It should be noted, however, that as the word moved out of South America it came to refer to similar preparations made with other esculents: 'Tapioca' in Britain often refers to a rice pudding thickened with arrowroot, while in Asia the sap of the Sago palm is often part of its preparation. Preparation and extraction. Crushing of the cells and separation of the granules from other insoluble matter (i.e. adhering dirt and cell-wall material), including the preparatory operations of washing and peeling the roots, rasping them and straining the pulp with the addition of water. Purification. Substitution of pure water for the aqueous solution surrounding the starch granules in the mash obtained in the first stage, as well as the operations of sedimentation and the washing of the starch in tanks and on flour tables, silting, centrifuging, etc. Removal of water by centrifuging and drying. Finishing, grinding, bolting and other finishing operations.